Do you detect the recurring theme here? Quick and easy meals invariably call for pasta at casa del Creative Pot and it seems that peas are a regular partner in crime. The reason for this is simple - peas are one of the only frozen veggies I have available, so when there's nothing else in the fridge, the humble pea leaps forward with both feet and demands that it be given centre stage. Okay, maybe that's not quite how it goes, but I'm sure you get the idea. I got the idea for this pasta sauce in a Woolworths Taste magazine (I *think*) - they originally combined peas in a blender with some creamy bulgarian yogurt to make a delicious pasta sauce. I've since adapted it to included buttermilk instead of yogurt, and adding browned button mushrooms on top (which, incidentally is a delicious combo). I didn't have any dairy products on hand this time though and seeing as we're on the end-of-the-month-salticrax (my fellow South-Africans will know exactly what I mean), I had to make do with what we had on hand - olives, capers and a few babymarrows. Oh, and a splash of wine. 'Cause wine makes everything better (that's a little something for future reference, just so you know). I unwittingly ended up with a vegan dish. Which was incidentally also pretty damn tasty. Don't be tempted to leave out the capers or olives - the peas need a bit of a kick in the behind to liven them up. 1. Cook pasta until al dente in a big pot of boiling salted water. Toss with olive oil and set aside. 2. Cook babymarrows, peas and garlic in a little bit of water over medium heat for a few minutes or until babymarrows are soft. Transfer to a blender and blitz to a velvety green puree. 3. Return puree to saucepan, add wine and lemon juice and season to taste. Cook for a few minutes or until wine gets absorbed and sauce thickens slightly. 4. Toss with pasta, adding a little bit of water to loosen (if neccessary). 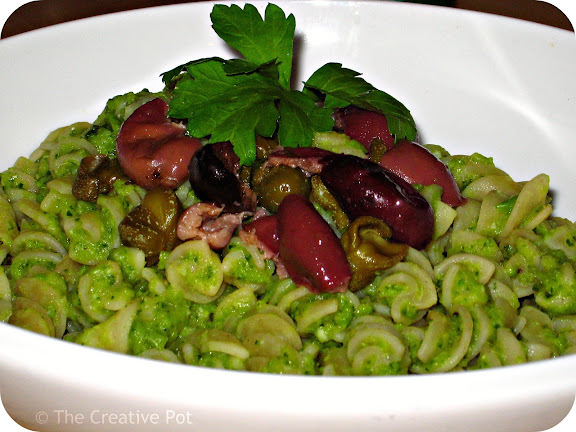 Top with capers and olives and serve immediately. Are you sure this serves 4. For me, it serves 2. One for serving for me now. And one for me later. No sharing. I like your sentence: Wine makes everything better. I agree! I often use similar ingredients to make pasta sauce, but it's usually creamy and chunky. I love your idea of blitzing eveyrthing instead!